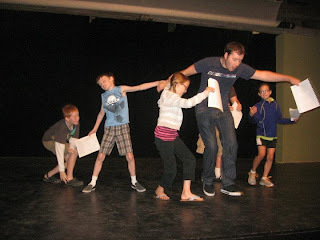 Putnam County Playhouse: Children's Theatre Workshop Continues! with some of the CTW participants. Each morning this week, the Hazel Day Longden Theatre is home to the annual Children's Theatre Workshop. From 10 a.m. to 11:30 a.m., Caroline Good and her assistants work with youngsters ages 8-11. The participants learn basic theatre vocabulary, basic acting technique, movement, and voice for stage among other activities. The workshop will culminate in a work-in-progress presentation on Saturday, July 28, at 11 a.m. The public is invited, and the presentation is free. Included in the presentation will be excerpts from two plays - "Snow What?" by Susannah Howard and "Robin Hood" by Charlie Good - and dramatizations of two Dr. Seuss and poems by Shel Silverstein. The workshop is sponsored by Duke Energy Foundation.